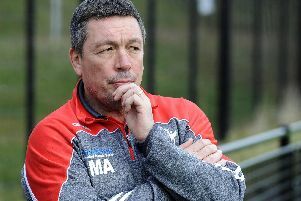 Sheffield Eagles will have St. Helens utility man Matty Costello available as final preparations are made for their inaugural fixture at the Olympic Legacy Park. Mark Aston has been boosted by the arrival of the youngster on dual-registration, as his side look to begin their return to Sheffield by upsetting the odds against Toronto Wolfpack on Sunday (3pm). With Saints colleague Matty Lees not available, Costello is added to a squad which could also include centre Josh Toole who is fit again after a wrist problem. Toronto, who could include ex-Eagles favourite Quentin Laulu-Togagae, have made an impressive start, but Aston has been encouraged by what he has seen behind the scenes, as the Eagles go in search of their first points of the season. “The lads have gone a little bit harder on each other and played a bit tougher this week because we need to sort our mentality and attitude out, and once we have that then we can kick on,” Aston told The Star. “There have been some really good signs on that this week which is promising because we are playing against a very good Toronto team. “Josh Toole has trained this week so he’ll be back. We have a kid called Matty Costello in from St. Helens. “He is a full-back or centre and he can also play on the wing, and he is someone who has a big future. Preparations are almost complete for the return, with the Eagles hopeful of a crowd of 600 plus. The dugouts and scoreboard are now on site, with the unexpected extra week, following the London postponement, giving the club priceless extra time to be ready for their homecoming. “It’s exciting. It is now looking like a stadium,” Aston beamed. “There has been a lot of hard work gone into this. “The fencing has been wrapped, the branding is there, and there has been a lot of work put in on the field by Pulse who manage the site. “Their team have worked hard getting some of the lines off so it now really looks like a rugby field. “Liam Claffey and Mark Hannigan have done a fantastic job from the club as well, so we are nearly there.